Gylfi Sigurdsson scored two goals as the Icelanders secured a memorable victory at Laugardalsvollur and condemned Oranje to a second defeat so far this campaign following last month's reverse at the hands of Czech Republic. 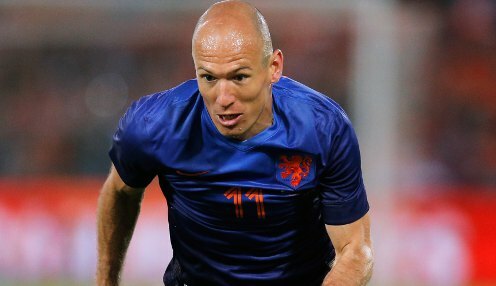 Holland now trail joint-leaders Iceland and Czech Republic by six points in Group A and Bayern Munich flyer Robben pulled no punches with a damning assessment of the performance. "This was not worthy of Oranje," he told NOS. "But we did it all ourselves. We need to look at ourselves. We made things unnecessarily hard for ourselves. "Now I have to be careful what I say because I'm so angry. We shouldn't point fingers at each other, but what happened shouldn't at this level. "If you play like this, you don't win games. It's just not going well. Besides the fact that we gave away two goals, we're also not where we want to be football-wise. "In the first half, we created three chances we should have scored." Guus Hiddink has tasted defeat in three of his four games since retaking the reins from Louis van Gaal and has also come under scrutiny. Defeat against Iceland was a far cry from the memorable 5-1 win against then-holders Spain at the World Cup in Brazil this summer and Robben said it was about time his team-mates stopped basking in former glories. He added: "We must stop comparing. We have to stop looking back. We have to look at ourselves in the mirror. We've started over again. "We must not think we are good because we're not good. We can be good, but we're not good. "We're still not among the top countries in the world and we must fight hard for good results. It wasn't good enough. Euro 2016 is two years away and we want to be there. But a lot must happen." The Netherlands are currently priced 1/1 in the Group A qualification betting and 1/1 in the outright winner market.